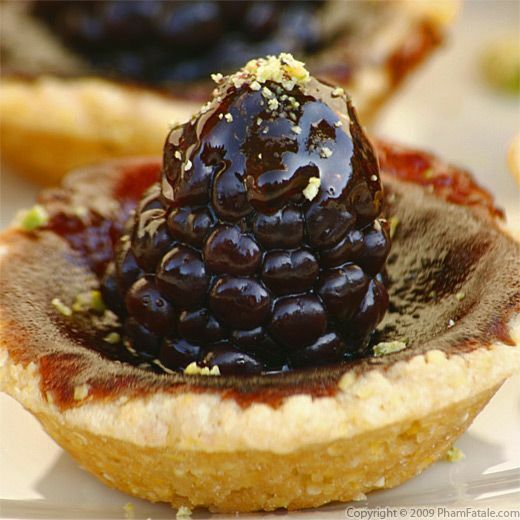 I recently made my blackberry polenta tartlet with a ginger lime glaze (check out the recipe ) again for a dinner party, but this time I made bite-sized versions. I had made some pasta with pistachio pesto for the main course and as another improvisation, I sprinkled the leftover pistachio powder on top of the tartlets. I think it worked out well and brought a nice contrast of color to the dessert. This week, I was wandering around one of my favorite places, Williams-Sonoma in the Stanford Shopping Center, in Palo Alto, California. I was so happy to find non-stick petit four pans; these pans are very hard to find. It's a set of thirty with 5 different shapes, all made in France. It was $26. I couldn't ask for a better deal. I've been using them as often as I can think of a mini-version of a dish, whether it's savory or sweet. Traditional tarts are an elegant finish to any meal, but I always find them so difficult to cut without making a mess. When all the guests left, there was only one tarlet left in the platter. Maybe they were too shy to take the last bite. Of course, Lulu, gallant as always, swooped in and saved me from having to wrap up the leftovers. He's always such a gentleman. I could eat a dozen of those! These look great. What a terrific idea for a dinner party. Your photos are gorgeous - you have quite the eye. Thanks for stopping by my kitchen. It gave me a chance to meet you. I would have been here sooner but I've been on holiday with no internet access. It's nice to be home to see what goodies every one is eating. these are so adorable! the perfect bite-sized sweet. the combination of flavors sounds awesome. and i have a blackberry bush, so it's perfect! i like your idea about sprinkling pistachios on top. i would think the ginger lime glaze AND the pistachios would be excellent together. So pretty and unique, they are just lovely! Looks delicious. Anything bite-size is wonderful. What a super fantastic idea. Love the idea of dessert bites. Such a deliicous filling to! What beautiful little bites! I love miniature deserts. They are so elegant and delicious! And I love the flavor combinations here. Just perfect! a whole set of petit four pans for $26? individual desserts are not only adorable, but much easier to share. your pictures are beautiful!! What sweet little bites! A wonderful idea! These are adorable. Your guests must have loved them. Oooohhh, these look gorgeous! 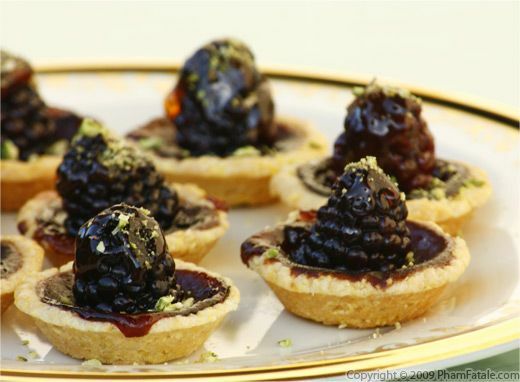 I love mini tartlets and these look so fresh and flavorful. Lovely dessert option for a dinner party. Oh, I love any dessert when it's mini. Somehow makes it taste even better. The tarts look just perfect. These miniature sweets look perfect for a dinner party!